Show and Tell: my Mendini MV400 violin. I originally wanted to get a purple violin but decided with the antique finish and i'm glad I did. I'm keeping it simple and traditional. For $60 from KK music thru amazon.com, it came with the violin, rosin, spare bridge, spare strings, padding bar and one bow. I love how it looks and can't wait to start playing without breaking strings. 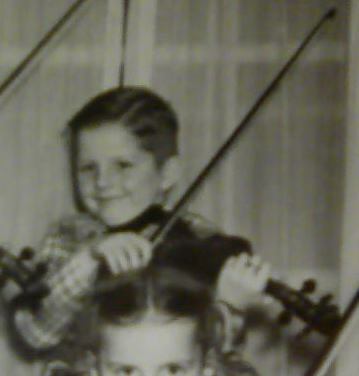 I noticed just by playing that the coordination of bowing and playing the strings with my fingers will be interesting. Practice makes perfect...I know. Thanks for checking out my new baby. Welcome, Carolina; Yes it not only happen's to the inexperienced, it happen's to seasoned player's as well. There are ton's of video's online on how to tune your violin and what to do when one of the peg's won't hold. You need to push in on the peg while turning it. The E string is very thin / fine and will snap in a heartbeat if tightened too much. Turn the peg until you are very close to the pitch you want, then tweek each string using the fine tuner's. The string's that come on / with an inexpensive violin are usually steel core string's and should probably be changed to synthetic core string's. However, it's not imperative that you do this immediately, but in the near future as you will get a nicer sound from your new baby, she's a beauty alright. Good luck on your new endeavor and be sure to practice technique. hehe. I was surprised by how small they seem when you first pick them up and meet them up close too. but they're all as they should be. I've found (and I started around the end of last month) that initially they are really difficult to keep in tune, even though I'm used to tuning guitars. but part of the problem is being new. I don't know if that's as much a problem with a better instrument, but mine is starting to settle down now, and the strings are staying in tune long enough for me to get them ALL in tune, and play for a while now. initially I couldn't get every string in tune at once, so I'd aim for getting close, then practice my bowing, and just go up and down through the positions, even though the sound is poor. I'm now getting a few scratchy little tunes, and actually managing to get the instrument in tune. which surprised me, but then those kind of strings are not necessary as of yet. when you get a bit more confident, some of the beginners sheet music here is very good, and explains where to find the notes easily. have fun learning. I know I am. Welcome and congrats on the new instrument I can relate to the size and how delicate the instrument looks but you'll soon be amazed with the sound this instrument you got projects for its size. Yes braking a string is common and it would be wise to go to your local store as the strings should be wound on to the peg in a certain fashion and also just because the bridge was standing when you got your violin doesn't always mean its positioned properly and if its not your violin will not tune properly from the get go,not to mention if its not set properly you can damage the instrument. I broke both "G" strings I got with my first violin before I figured out that I'd let them back of causing them to unwind the windings around the core of the string and in the end they both snapped at the peg box. And just as a matter of taste I would consider actually replacing the strings you have I'm certain their steel core but as I said that's a matter of taste and after reading up on strings I went with synthetics a good set be forewarned is pricey for the average person but they can last a good while depending on how often you play. But do take to someone who can set it up for you as you will surely have a better experience than I did. Congrats and nice to meet you. It is great to have all the new violins and members s showing up. This is a great place. Nice chatting with you on the chat box. Your violin is pretty! I'm happy for ya Carolina. Keep us posted on your progress as well. It's been a few months now since you got that violin. How's it been treating you? Sorry, I've just been skimming through old threads, and haven't seen you on here lately. congratulations on getting a violin. if you didn't already know, using peg compund or wax helps loose pegs to stick. just thought you might want to know. Welcome Carolina! And congratulations on your new baby. I, too, was amazed at how tiny my violin seemed when I first got it. Now, when I pick up my guitar it seems HUGE. welcome aboard !! congrats on your new fiddle ! !